Because one just wasn't enough. I'm afraid this blog post is terribly overdue. I completed and gifted this second Frukttradgard hat to my friend weeks ago now! I learned with this project that there is something to be said for knitting the same pattern twice. It went much more quickly and smoothly the second time. It was a wonderfully relaxing knit. And the great news is.. I even saw my friend wearing it the other night. 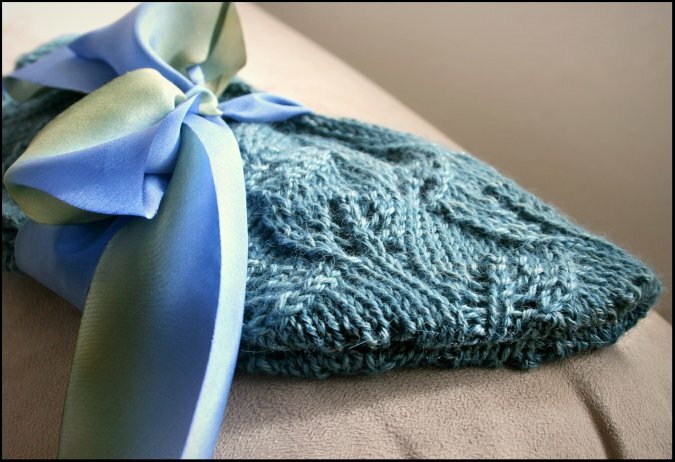 When I actually see my gifted knits in use, (Which doesn't happen often) it is so exciting! When I find someone appreciative of my hand knits, I want to do nothing but knit them things for the rest of my life. Seeing my knits being loved and worn brings me great satisfaction as a knitter. I knitted this one out of Road to China light in the aquamarine colorway. Pretty isn't it?